I don’t like sake, or at least without food. This I only got to learn after several unsuccessful vague attempts and just recently, a visit to Maedaya in Richmond. This small, but soon to be upgraded stylish bar and grill centres on drink and food matching. On the food side the grill at the centre of the restaurant is the highpoint of the menu. Six different types of skewers will get you going along with a glass of plum wine on ice. 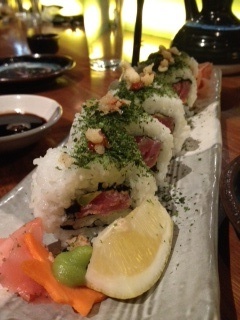 For mains think of spicy tuna roll or salmon and tuna sashimi with paper-thin slices of lemon and a punchy-sweet wasabi. To match, there are more than a dozen sakes to choose from or a carefully selected beer list. In the background you will also hear the latest and funkiest Japanese bands getting you in the mood to boogie. Excellent food+drinks+music=bliss.